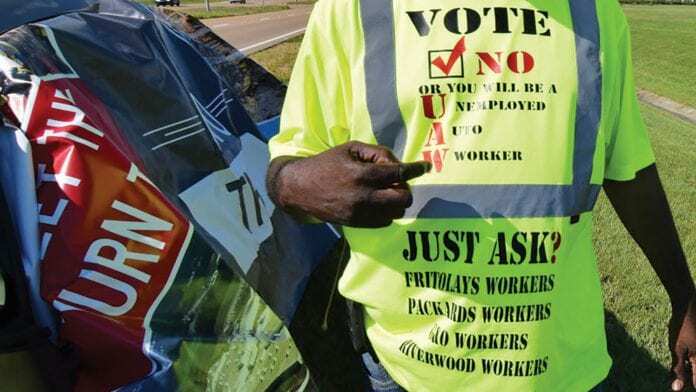 CANTON, MS — Workers at Nissan Motor Co Ltd’s plant in Canton, Mississippi, voted nearly two to one against union representation, the company and the United Auto Workers said late on Friday. The vote at the end of a bitterly contested campaign extended a decades-long record of failure by the union to organize a major automaker’s plant in the U.S. South. The vote at the Canton plant could leave the UAW weakened ahead of contract negotiations with the Detroit Three automakers in 2019, when many analysts are predicting a cyclical slump for U.S. auto sales. The last failed UAW vote in the U.S. South, at a Volkswagen AG plant in Chattanooga in 2014, was far closer than the tally in Mississippi. Pro-union workers say the Nissan plant – which builds Nissan Murano sport utility vehicles, commercial vans, and Titanand Frontier pickup trucks – has a poor safety record and the automaker moved them to a 401(k) defined retirement plan from a traditional pension fund. The UAW had put 10 years of groundwork into the vote at the Japanese automaker’s Mississippi facility, after two unsuccessful attempts at a Nissan plant in Tennessee, only to fall well short in a bitterly contested campaign that the union maintained was a continuation of the civil rights struggle of the 1960s. The UAW has maintained that Nissan has illegally threatened workers with the closure of their plant or the loss of their jobs if they voted in favor of unionization, a claim Nissan hotly denies. That claim has been backed by a number of complaints lodged by the NLRB. The union said in a statement it is asking the NLRB to proceed with a trial to “stop Nissan’s serial commission of unfair labor practices in Mississippi.” The union claims in fresh charges filed with the NLRB that Nissan “conducted repeated captive audience meetings” and played “virtually non-stop anti-union videos” ahead of the vote.